The OMEGA™ Spring Suspended Movement represents the new look of the future. Wearing parts have been reduced to a minimum. The entire movement is now suspended between two springs, the Bourdon tube above and the link below. For the user, this means greater resistance to mechanical shock and vibration. This increased resistance to the effects of rough usage contributes to longer gauge life. The high reliability of the OMEGA™ commercial gauge line is chiefly attributable to the unique OMEGA™ spring-suspended movement. The entire movement is suspended between 2 springs, the Bourdon tube above and the link below. Wearing parts have been reduced to a minimum. Movement parts are ultrasonically cleaned and lubricated with silicone oil to ensure long cycle life. The OMEGA™ spring suspended movement is largely resistant to shock, pulsation, and vibration. The result is longer gauge life. 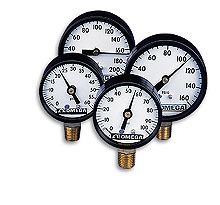 The numerous applications for OMEGA™ commercial gauges include installation on pumps, portable compressors, industrial machinery, hydraulic and pneumatic systems, instrumentation, and pressurized vessels. 精度: 3-2-3% (3% over first & last 10% of range, 2% over remainder). 注: Custom dial faces available. $125 set-up charge and 100 peice minimum order.